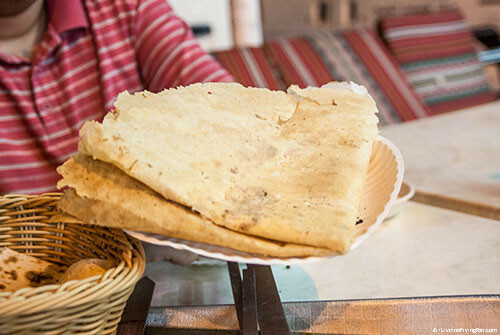 Be it the pillowy pita or the raggedy injera, breaking bread across the many ethnic communities in Dubai is an incredible way of experiencing its melting pot – or heart-warming oven – of cultures. 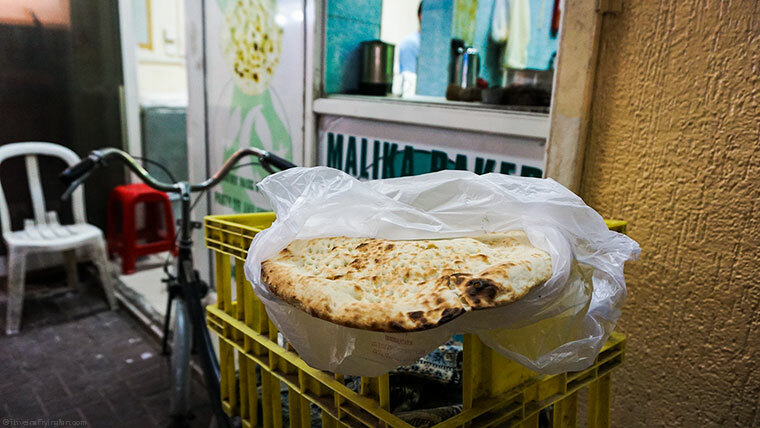 At this junction of the Middle East, Africa and the Indian subcontinent, you can find breads that have sandwiched together stories, families and dinner traditions across generations. Here’s a trail through some of the breads that I think would make any hummus, daal or kabab feel special. They’re not all strictly made in an oven, a few in the list are smeared atop a griddle or sizzled in a pan. But no matter the method, these savoury crumbs enjoyed across the cultural pockets of Dubai’s vibrant society are worth your nibble. Locations: On my Google map of hideouts, please select the layer called 003 Trail of Crumbs. 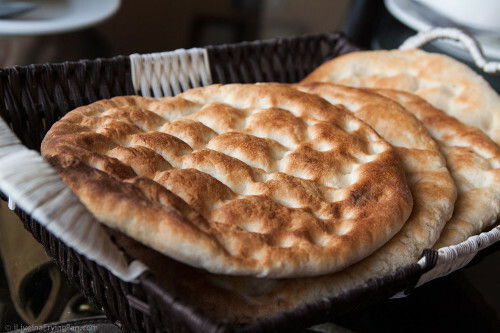 This Iranian bread is made of a gloopy leavened mixture of whole wheat and white flour dough, and ingeniously spread over washed and heated pebbles. Hence it's been christened Sangak, or 'little stones.' The baker perforates the length of the bread with his fingers, which prevents it from rising into a chunky inedible slab. 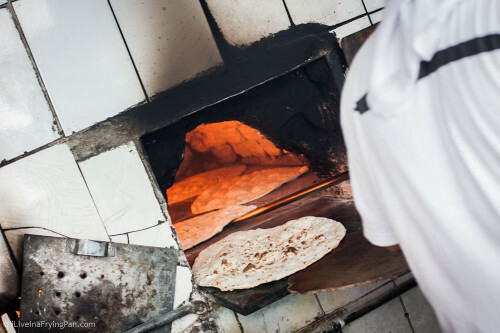 The sangak ovens at Abshar (both their Maktoum and Jumeirah branches) and Pars (their Satwa branch) are recommended if you’re the inquisitive kind who likes to step close and stick your head into the oven. My preference is to have sangak slightly under-baked, so that its stone-crisped skin can unveil moist, tender dough pockets within. I'd recommend a DIY Sangak Sammy with a generous smear of salty feta, crushed pre-soaked walnuts and reyhaan (an aromatic type of basil). Or wrapped around a fat-dripping minced lamb kabab. Or dipped into honey comb and fresh cream. Or eaten with the Gods in the garden of Eden. This is not technically a bread but closer to a pizza – but then, one could argue that a pizza is technically bread that’s pre-paired with ingredients. 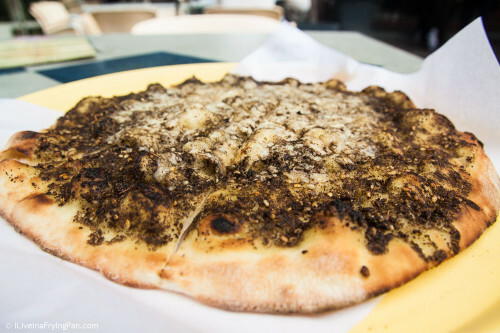 However you chose to interpret it, your life in Dubai simply cannot be complete without copious quantities of za’atar and cheese mana'eesh (pl.) 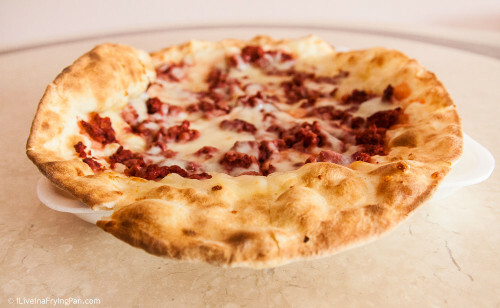 This Lebanese pizza is typically sauceless, with the olive oil serving as the glue for the surface ingredients like herbs and meat (first photo above from Al Mukhtar Bakery). I typically cave in to one, maybe two orders per week, all from a Lebanese chain called Breakfast to Breakfast (BtoB) that serves a thin-stretched, less doughy version (manoushe ‘light’) upon request. And once every few months, I surrender to the grease-dripping power of their cheese and spiced sausage (sujuk) manoushe (second photo above), best enjoyed fresh in the café rather than delivered home. Old timers also swear by the mana'eesh from the classic 2am post-party pit stop, Al Reef bakery, or at Al Mukhtar on Ittihad road (technically in Sharjah) – but when you’ve had the lighter and more flavourful version at BtoB, you’ll find your loyalty lasts no longer than the piping hot manoushe on the plate. Hoards of bachelors depend on communal roti ovens, usually manned by about two to three skilled Pakistani or Afghani men who roll out the white flour dough, dexterously flip it between their palms till it stretches to a perfect circle, sling it over a cloth cushion and smack it against the sides of a cylindrical, vertically-oriented tandoori oven. Once the roti bubbles up to a crisp, it's extracted out of the hot burrow with two metal sticks and bagged up for the bargain price of AED 1.00 per roti. These bakers usually bake both a leavened or an unleavened pockmarked roti, and I dare you to not pluck at it before you’ve recruited a suitable curry accomplice. 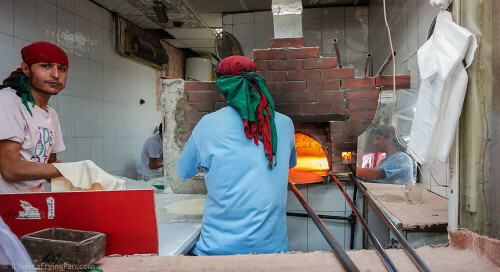 You can spot these ovens across all neighbourhoods where the blue-collar working man resides – be it the alleys of Satwa, Naif (Deira), Hor Al Anz (Deira) and Meena Bazaar (Bur Dubai). 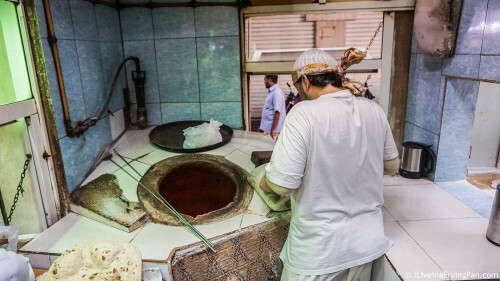 Incidentally, this tandoor also makes an appearance in Iraqi and Iranian restaurants, not surprising given that the Middle East (specifically Mesopotamia) was the original birthplace of the ''tanoor'' (Arabic) or ''tinuru'' (Semitic) oven thousands of years ago. Another common type of roti oven, often fired up in the same areas where the Tandoori ovens work, is the pizza-style or masonry oven. I've heard bakers call the oven ''baachi'' once in Naif, though they reckon that's a local name rather than one used back home in Afghanistan/Indian/Pakistan. 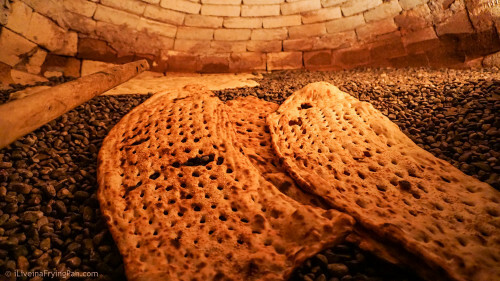 The dough is typically unleavened and I find that roti emerging from these ovens usually remains tender for longer than that out of a tandoor. On my sister’s Little India food trail, she uses the roti as a piping hot canvas over which she smears clarified butter (ghee) and jaggery before rolling it up into a sweet buttery mid-meal snack. Hot, fresh, tender, bubbly, butter-dripping, sugar-laden bread…and you’re telling me room-temperature cupcakes are a thing? Puh-lease. 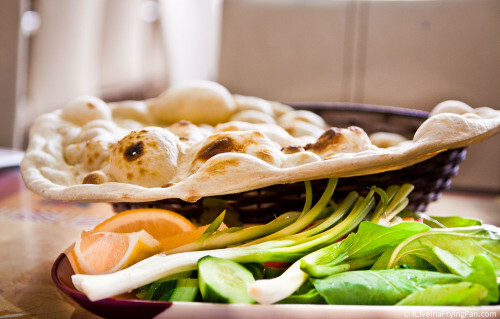 Paratha is that form of shallow-fried bread that makes curries happy across the Indian subcontinent. 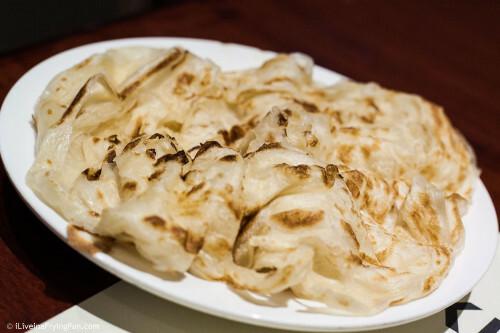 'Paratha' is the North Indian term for the layered whole wheat flour bread, while 'Parotta' refers to its more elastic, fluffy and fair-faced South Indian style cousin (pictured above). Meena Bazaar abounds in shops that serve Paratha for breakfast, ideally paired with lentils, yoghurt and/or chillies fried in mustard oil. This North Indian variant can also be stuffed with everything from potatoes to sprouts, with places like Paratha King offering over a hundred mind-boggling stuffed choices for the chronically indecisive. The always un-stuffed South Indian parotta version is usually found in Keralite cafeterias, where they hand out parotta and omelette rolls for exponentially less than the price of water in most high-end restaurants. It doesn’t take a genius to tell you where I’d invest my money. Most North Indian restaurants worth their salt – like the Mughali-style Sigdi for instance – will have a selection of at least six breads on their menu if not more. If you trawl through North Indian bread baskets across the city, you will find everything from the flat makki ki roti (maize flour) to the deep-fried puffy puri, which is best deflated over a bowl of curried chana (chickpeas). Worth trying is Ballimaran Dilli's Lucknowi sheermal, a chewy amber-coloured flatbread whose milky sweetness amplifies the primal flavour of its molten Gulawati Kababs. (first picture above). I’ve also always had a soft spot for the potato-stuffed kulcha (second picture above) from Kulcha King, a franchise that has grown from a small hole in Bur Dubai into an empire with bulletin boards across Sheikh Zayed Road. 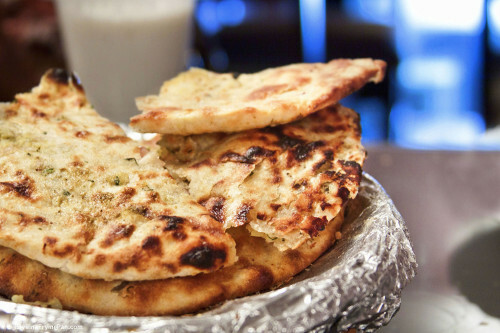 Their Punjabi (specifically Amritsari) kulchas are stuffed with a soft mushy layer of potatoes, laced with onions, or injected with cheese if you so desire, and sprinkled with a fine powdery film of tangy chaat masala. Topped with a hunky knob of butter and served alongside chole and a sweet-spicy onion and chilli chutney, this is easily one of the most addictive breads that emerges out of Dubai’s North Indian kitchens. In all the gluten-blasting rhetoric we’ve heard over the past three decades, my only thought (other than, sure, go gluten-free, more bread for me*.) has been, why on earth aren’t we giving some bread cred to the South Indians? Their fermented rice flour and white urad dal concoctions are what gluten-free dreams are made of – and those dreams are realized every day at dirt cheap prices in Dubai. 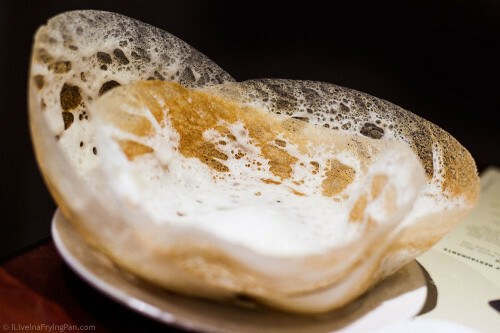 Calicut Paragon’s bowl-shaped appams (pictured above) do an instant disappearing act every time they hit a table – best paired with crab or fish curry. Dosas from Woodlands, Aryaas or Sangeeta are tried and tested by those-in-the-know. And then there are the uttappams and idlis that any South Indian restaurant in Karama that’s worth its sambar will have on its menu. If you don’t know what these strange exotic words mean, please hail a cab and visit Karama. IMMEDIATELY. **My frivolous gluten-free comment is not aimed at anyone with celiac disease or medically proven gluten-free intolerance/allergy. It's more for these kinds of people. Regag is closer to a cracker or crepe than what we typically consider a bread. But similar to bread, it requires a great deal of dexterity in making it. A heavily hydrated ball of unleavened dough is slapped against a griddle and fanned out into a thin film which cooks until crispy. It can be eaten plain or amped up with mahyahwah (anchovy sauce), eggs, cheese or honey. The key to a successful regag is in the texture – the crispier the better. One of my personal favourites is at Labeeb Grocery in Jumeirah, though I’ve also enjoyed a stellar version at the Global Village in past years. This bread can also be crumbled up and added into a meat or chicken stew, making a dish called Thareed that was the favourite of the Prophet Muhammad, thereby making it a revered specialty of the Gulf and broader Middle East region. 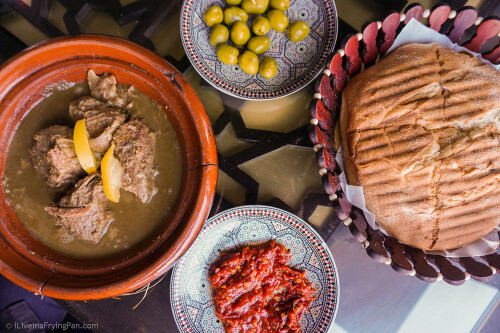 No Moroccan meal can be complete without plump, crusty loaves of khubz. The best ones have a crisp semolina-dusted shell with soft cottony chambers that are perfect for making love to a slow-cooked tagine. You can grab a fresh-baked round of bread at either Marakesh Bakery or Aghroum Bakery in the less-known Abu Hail neighbourhood. Even if you couldn’t find the right tagine (I am guarding my favourite place with my life – the last two places I wrote about on my blog shut down, so I won’t jinx the third), I find it hard to believe that a home-made lamb stew wouldn’t make a lone khubz feel whole. 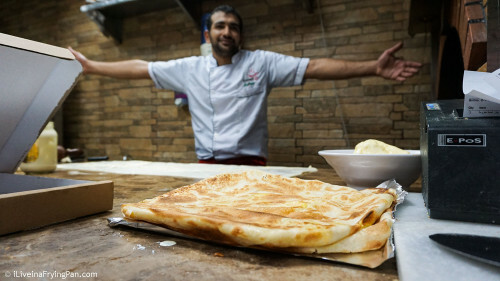 Another bread to try at Aghroum Bakery is the Msemen, similar to the North Indian paratha and often stuffed with meat or onions. I've yet to find someone who has not incessantly snacked on it whenever it made an appearance. And if I do find that someone, well then, there's more for me. I once had a guest on one of my food trails mistake the injera at an Ethiopian restaurant for a hand-wiping rag. I couldn’t blame her, the grayish mottled appearance of Injera doesn’t inspire you to leap forth and ravenously tear it off for a taste. But once you’re past its alien appearance, you might begin to appreciate this intriguingly sour scooping tool for your spicy Ethiopian stews. Injera is made with a grain called teff, a super healthy grain that didn’t naturally grow in the rest of the world until the Americans fell in love with it and decided to cultivate it closer to home. 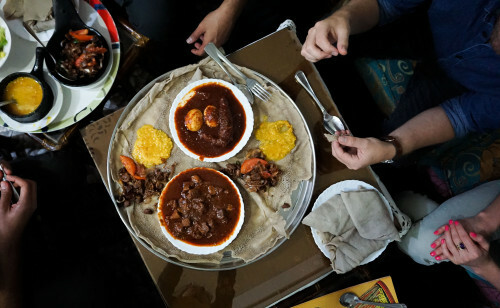 The Ethiopians spread this fermented bread like a cloth across the serving plate or mesob and ladle their stews, lentils and vegetables directly over it. This allows the juicy berbere sauce and other gravies to soak irresistibly into the bread, and before you know it, that hand-wiping rag has become the inseparable lining of your tummy. 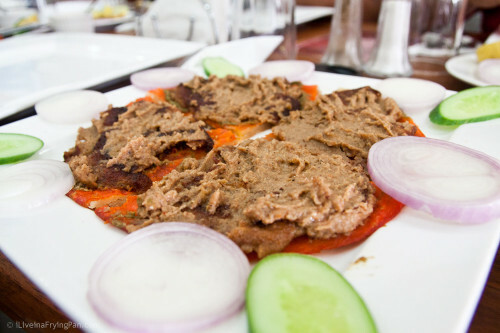 Sara makes two kinds of injera at her extremely popular Habasha restaurants – a regular pale one and a brown one that she claims is healthier. The theatrics involved in making Egyptian feteer are only surpassed by the taste of the fresh buttery layers of bread itself. White flour, water and butter are combined to make a stretchy, slippery dough that is flipped in the air till it is stretched out as thin as phyllo. Multiple feteers can be layered one inside the other to make the famed ‘feteer mshaltet’ which goes well with honey, cream or if you want to live dangerously, both. While Al Ammor is the feteer stalwart, I also adore Soarikh’s savoury feteer filled with veggies, basturma (salty dried beef) and two kinds of cheese – a cow’s milk mozzarella and a goat’s milk Turkish cheese. You can go wild with the savoury and sweet variations, with the custard-filled or cheese-honey versions being the perfect remedy for post-sandstorm melancholy. It has admittedly been eons since I’ve visited a Turkish restaurant so this may be the worst written paragraph in the rich history of Turkish breads. But once upon a time, I did stumble across a “fresh bouncy pide dotted with sesame seeds” at Yildiz Saray and “baked Turkish naan matted with white sesame and black nigella seeds" at Bosporus (first picture above) – but these distant memories need some serious rechecking to see if the quality of the food still holds up to my prehistoric reviews. I’ve recently read some mixed reviews online for both places, especially around shoddy service standards, so Í’m not suggesting you run out this very second to lure a pide into your tummy. 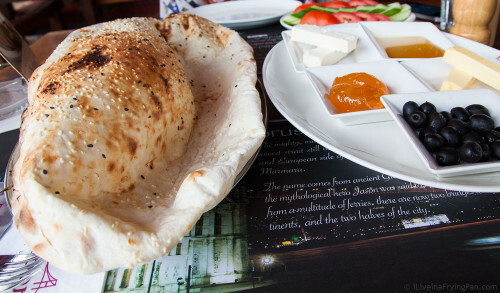 I vaguely remember enjoying the bread at Zurna as well as the one at the newish Mavlana in Deira. And the second seedless pide pictured above is from a restaurant called Kervan Saray that is situated somewhere in Qusais and serves reasonably priced, very forgettable Turkish fare. And that’s that. Thank you for wading through the worst paragraph written in Turkish bread history. The Filipino community hides some of the least celebrated but most soulful Portugese-influenced baking traditions in Dubai. 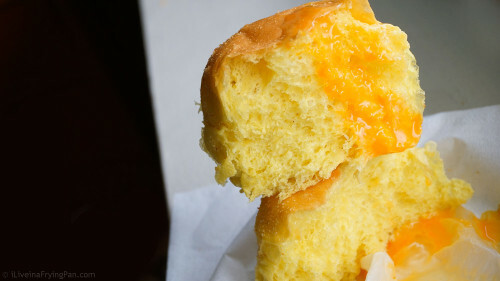 The grocery stores in Filipino-dominated neighbourhoods like Murraggabat usually stock sweet cushiony rolls of Pandesal that are just crying to be dipped into well-seasoned runny egg yolk, alternated with sips of milky cardamom tea, or swiped across a bowl with any sort of gravy that needs mopping up. Honestly, it’s not hard to find a cross-cultural match for these irresistible milky buns, though their submissively soft texture makes them easy to enjoy in isolation as well. This trail of crumbs is far from complete. I feel somewhat guilty for ending this post, knowing full well that there are a number of other traditional breads out there that I’ve overlooked or not even tasted. Fill in the gaps…what are your favourite breads in the city? Fantastic round-up Arva! In Sharjah, close to where I reside, we have a neighborhood Afghan bakery shop from where we’ve been purchasing fresh rotis for the past 10 years. Possibly the best fresh bread one can purchase for a dirham! Part of our dinners for many years now. Every crumb looks delicious! 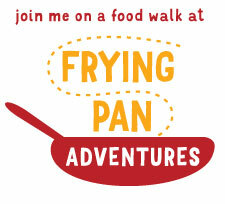 The first pic brings back fun memories of the food tour. :) Great post – really fascinating to see a compilation of the different interpretations of this staple. Was just reading another post about French baguettes this morning – now have a full-fledged craving for some fresh baked bread! Also worth trying is the “neypathal” (deep fried rice bread) at cocoriva restaurant Damascus Street, Ghusais. You missed out mentioning the lesser known but popular non-fermented cousins of south indian dosa’s – ari pathiri from kerala(more like roti made from rice)- neer dosa from karnataka- adai from tamilnadu(nothing that sells in a hotel comes close to homemade adai, typically paired with jaggery & fresh white butter, not avial as is common in restaurants), pesarattu upma from andhra.